I worked most of yesterday on stitching around the applique' of the Pumpkins yesterday. I completed 4 blocks, so that is 7 complete blocks and 5 more to go, plus the header. I know I'll get there!!!! I love the way it is turning out. It is going to wonderful to hang it in our foyer, above the stairs. Since I feel accomplished with all my stitching yesterday, I decided to mix it up and paint today. 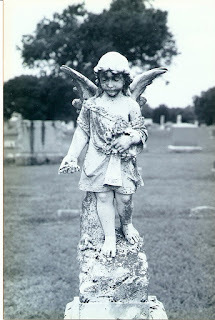 I took this angel picture at a cemetery where some of my ancesters are buried in Texas. I'm going to enlarge it a bit and sketch it on a white T-Shirt and then watercolor. I have the vision in my head, so I hope it comes out the way my head it thinking. I'm also going to quote Hebrews 13:2 - "Be not forgetful to entertain strangers: for thereby some have entertained angels unawares." We have this verse on a plaque at our front door, and I think about it alot. Before I put this on the T-Shirt I'm going to test it out on PFD first. Can't wait to post the project!